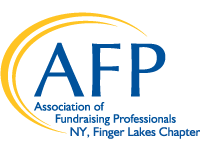 Finger Lakes NY Chapter of AFP is pleased to announce that applications are being accepted for the 2019 AFP Foundation Chamberlain Scholarship Award. • The applicant must be a member of the Finger Lakes NY Chapter. • The applicant must be employed as a fundraising professional and/or have a position that requires at least half of their time to be spent on fundraising activities. • The applicant has never attended an AFP International Conference on Fundraising. • The applicant agrees to share a few comments about their experience at a chapter meeting and complete an evaluation form for AFP International. Applications must be received no later than Friday, October 19, 2018.